Playing defense in a flag football game can be challenging. The difficult part comes when a receiver has caught the ball in the open field. The rules of the game prevent you from bringing your opponent down to stop him. The only thing you can do is pull one of the two small flags that hang from his waistband. This can be a difficult maneuver because you can't get physical with your opponent. You can hold him up in an attempt to grab the flags, but there can be no physical punishment administered. Put your best athletes at the linebacker spot. Unlike touch football, offenses will try to put together a decent running game in flag football. But the majority of the running plays will go to the outside. Linebackers with speed can chase the running backs to the sidelines or pull the flags to prevent big plays. Keep your hands up when rushing the quarterback. In tackle football, pass rushers want to sack the quarterback. When rushing the quarterback in flag football, reaching down with your hands to pull a flag may give the quarterback a clear throwing lane. Keep your hands up once you get past your blocker so you can obscure the quarterback's vision. If the quarterback is right-handed, keep your left hand up in front of his passing arm, then attempt to pull the flag with your right hand. Keep the receiver in front of you when you are in pass coverage. Trying to catch a receiver from behind so you can pull the flag is very difficult. But if you can keep the receiver in front of you, you can wrap him up with your arm and shoulder, then grab the flag and pull it. Read the quarterback's eyes if you are in coverage. In flag football, most quarterbacks will stare down their receivers before throwing it. A smart defensive player will be able to take advantage of that by jumping the pass route and intercepting the pass whenever possible. Pull the flag on the opposing ball carrier but do not take the man down. 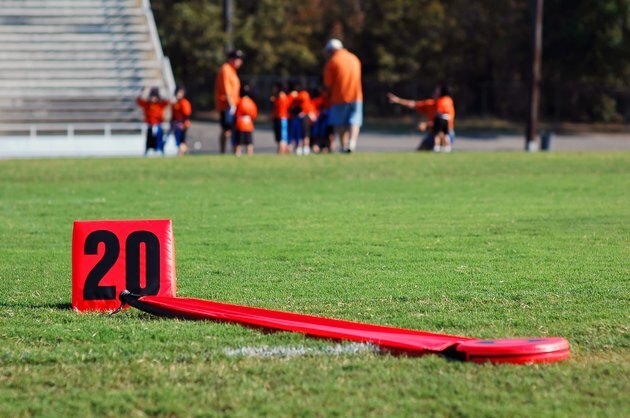 If you inadvertently trip somebody while diving to pull out the flag, the referee will likely let that go with a warning on the first offense. If the referee sees your play as too aggressive, you will get an unnecessary roughness penalty called that will be either 5 or 10 yards. If the referee believes you are reckless or trying to cause physical punishment by tackling, you will be ejected from the game and written up by the official. Players who are written up normally are not allowed to play the next game.